Rather than consciously choosing the lifestyle Liz Shankland’s evolution as a smallholder started quite by chance. As a journalist and broadcaster, with only sparse agricultural knowledge, she faced a very steep learning curve after buying a smallholding on a whim. 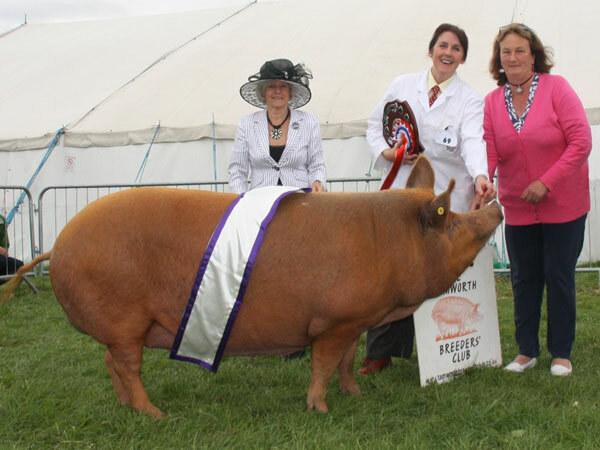 The evolution obviously suited her well though as she is now a regular course leader at Kate Humble’s Farm and has two Haynes Manuals (Smallholding Manual and Pig Manual) under her belt. Here the prize winning Tamworth breeder talks to Pocket Farm about the transition from townie to smallholding guru. I’ve been a journalist for more than 30 years – most of that working in cities and living in built-up areas. There’s nothing agricultural about my background. I was brought up in a little terraced house in Merthyr Tydfil in the south Wales valleys with a tiny postage stamp-size garden. My mum was really into growing veg, though, so I learned a lot about that side of things from her. However, as far as animals were concerned, the biggest thing I had contact with before getting into smallholding was a cat. I learned about everything as I went along. So what was the idea behind the hillside smallholding? Did you intend it as a lifestyle and career change from the beginning? Buying this place (which is on the side of a mountain overlooking Caerphilly, south Wales) was kind of an accident. I had just spent five years renovating a “normal” house and had no plans to move for the next 10 years at least. Then, after a commute back from my job at the BBC in Bristol, I was idly flicking through a paper and saw a property ad. I always fancied the idea of having a bigger garden because I was really into garden design at the time. It all happened pretty quickly – I had a viewing, put in an offer and a relative bought my house. It was the first and only place I viewed – definitely not the way to buy a smallholding! How did it develop into what it is today? It kind of evolved. I had no plans to keep livestock. I envisaged creating acres of beautiful gardens – but that never happened! Like most people, I started with laying hens, then came ducks and turkeys. When I got a bit of confidence, I bought some ewes with lambs at foot, got two goats, and, eventually, pigs. How did you decide on the specific breeds of livestock and poultry that you have chosen to keep? Anything that lives up here (we’re 800ft up and fairly exposed) has to be hardy. That’s part of the reason I chose Tamworth pigs. They live outdoors all year round, apart from when I bring them in for farrowing. I’ve also got Herdwick sheep, which are used to grazing rough terrain in the Lake District. They take anything the wet Welsh weather throws at them. Probably not a fair question but which are your favourites and why? No hesitation there – pigs. 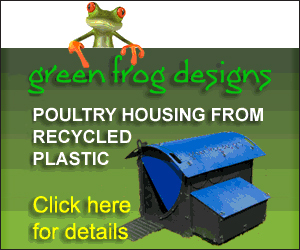 They’re so different to any other species – intelligent, charismatic and adaptable. I started off buying in two or four at a time as weaners for meat before starting to breed and building up a prizewinning herd. 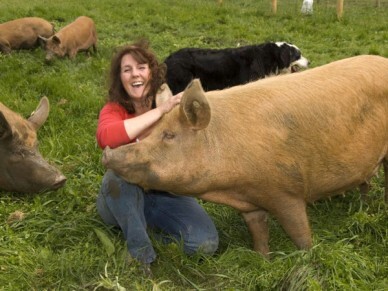 The sows are all individual – in looks and personality. You build up a relationship with them and it’s never easy when they die. How did the Haynes books come about? Were you given free reign or was it a very strict brief? I got an email out of the blue, asking if I’d like to write the Haynes Pig Manual – and I thought it was a joke! The project manager, Louise McIntyre, found me via some articles I’d written. To be honest, they were great to work with and were happy to be led by me on content. They also involved me all the way with regard to the layout and appearance of the book. I suggested Smallholding Manual: The Complete Step-by-step Guide to them and they liked the idea. It was much harder to write, because ‘smallholding’ means different things to different people. It was really difficult deciding what to include and what to leave out. I hope it gives people a good idea of what can be possible. And the teaching job at Kate Humble’s farm? When I was writing the Haynes Smallholding Manual, I heard that Kate had bought a council-owned farm which was going to be carved up into small pieces and sold off. Her vision was to set up a school teaching smallholding and rural skills, which I thought was a great idea. At the time, Haynes asked me if I could suggest anyone well-known to write a foreward for my book and I suggested her. They got in touch and she agreed – but then I found out that Kate was an avid reader of Country Smallholding magazine – one of the publications I write for – and had wanted to get in touch with me to ask if I’d like to be a tutor. Humble by Nature started offering courses in June 2012 and they’ve been a great success. I love it – it’s so nice meeting people who are excited about getting their own smallholdings and being able to help them make plans. From your experiences do you have any words of wisdom for would-be smallholders? Top of the list would be to decide if you’re really ready for a smallholding – not just you, but everyone it might affect. Depending on how far you go into it, it can be pretty tough, physical work and when you have livestock, they have to be top of your list of priorities. When it comes to choosing a place, don’t do as I did and buy the first one you see! Draw up your wish-list of desirable features – and things you really don’t want – and take your time. There are plenty of properties out there, so don’t be rushed into buying and certainly don’t rush into getting livestock once you move. Do your homework, find out what other people are doing with their land and when buying livestock, always buy from reputable breeders. Don’t underestimate the amount of land you might eventually need – it’s better to buy more and rent out the surplus than buy what you think is manageable now and be annoyed with yourself down the line because your ambitions grow and you can’t get any additional adjoining land. Buying land is like buying a shed or a greenhouse – you quickly find out that you need more space! Got anything else in the pipeline? I’m still working day-to-day as a journalist, writing and broadcasting, but I’m in talks about another book – again smallholding-related. Opportunities come up all the time but, when you’re freelance, you have to keep on looking for openings. I’m always available for hire! You can buy the Smallholding Manual on Amazon using the link below.